Estimates suggest we are caught on camera an average of 300 times a day. In East Sussex, where a state of the art digital suite was opened in Brighton police station last year the police say CCTV helped them with 4,800 arrests. 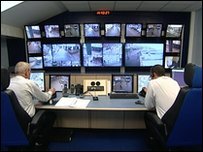 Kent Police attribute 180 arrests a month directly to CCTV. And despite concerns of Big Brother style infringements of civil liberties the public overwhelmingly backs the use of the cameras. Teenager Lloyd Dawson-Smith was attacked with a knife last year in Ashford. He nearly died but his two attackers have now been jailed. Lloyd's mother says the CCTV cameras in the area were vital to catching those responsible. Janice Dawson says without the cameras they could have got away with it. She believes strongly that there can not be too many CCTV cameras. In fact, in a survey by Lake Market Research commissioned by the Politics Show, 90% of the 270 people questioned in our region agree CCTV cameras are beneficial and 71% feel safer because of them. 42% would actually like to see the number of CCTV cameras increase, 40% think the balance is right and 17% would like to see fewer cameras. 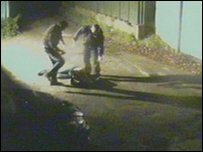 In Maidstone, Kent, in 2008 a gang of robbers broke into a jeweller's. The raid itself was caught on CCTV. The gang's getaway was also caught on CCTV. And when, a few minutes later, they were arrested, that was also caught on CCTV. "We couldn't have got the offenders as quickly without the cameras. "It saved hours and hours of police work trying to track them down. 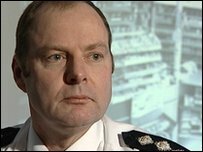 "CCTV is tremendously useful to us," says Chief Inspector David Pascoe of Kent Police. Network Rail has a less traditional use for CCTV footage. It uses images such as a woman wandering across the railway line in Crawley, as an aid when they go into schools to teach rail safety to children. In Kent, Canterbury has the highest concentration of CCTV cameras and in East Sussex Hastings has the highest number. The market town of Lewes in East Sussex has the fewest CCTV cameras. In Canterbury, the CCTV team says it is not just about solving crimes, but also preventing them from happening. According to Doug Rattray, Canterbury City Council's community safety manager, the possibility of being caught on camera acts as a great deterrent. He says: "The only time it doesn't really deter people is late at night when they've been drinking and act on the spur of the moment. "I don't think there's any benefit in banding numbers around about how much it costs and how many arrests it leads to, but suffice it to say the arrests happen a lot." You can text the team on 07786 209252 during the show.